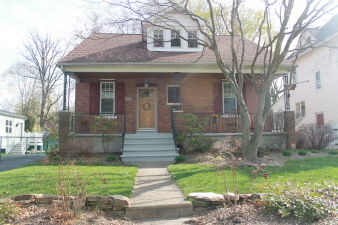 Charming and Inviting 3 Bedroom Audubon Bungalow including many updates and improvements! Covered front porch with attractive curb appeal, Bright Living Room showcasing the refinished hardwood flooring and crown molding. Good sized Dining Room with convenient shelving, chair rail, and open view of the Kitchen, which offers lots of counter space, tiled backsplash, tiled flooring, recessed lighting, butlers pantry and all appliances included! The main floor also features a bedroom and full bath. The second level offers 2 nice sized bedrooms, Full Bath, and oversized storage space! Full basement including the washer & dryer, bilco door access & partial french drain w/sump pump, all windows replaced with vinyl tilt-in, Gas Heat, Central Air, Large rear deck, fenced in yard, Detached 1 car garage with driveway parking! This is a fantastic home on a lovely street!